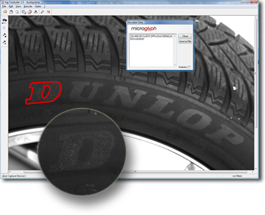 microglyph Codes are especially suitable for marking tires. A CO2 or Nd:YAG laser engraves the codes as tiny depressions onto the tire wall. The depth of the engraved mark is only a few micrometers, so that the function and safety of the material is not at all affected. The “black on black” mark is hardly visible to the human eye, however the codes are very robust and reliably readable. microglyphs can take any arbitrary shape, or can even be integrated in a logo. Due to the error tolerance and robustness of the codes, even inscripted or structured areas of the tire wall can be unobtrusively marked.